Tom Dietterich (left) was surprised to receive OSU’s Postdoctoral Mentoring Award. He was nominated by postdoctoral fellow Rebecca Hutchinson (right). 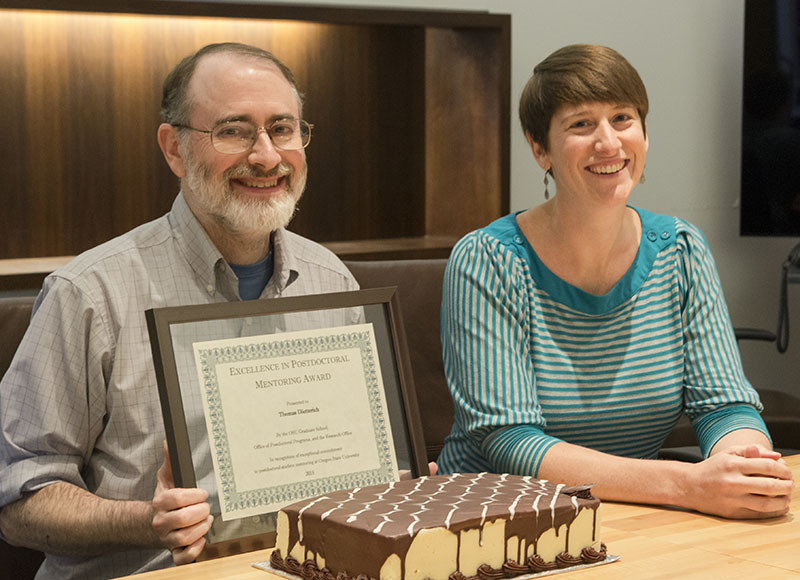 Tom Dietterich, Oregon State distinguished professor of computer science, was awarded the 2015 Excellence in Postdoctoral Mentoring Award by the Graduate School at Oregon State University. Dietterich has mentored 12 postdocs who have gone on to excellent positions that including academic appointments, industry leadership positions and research positions. His list of former postdocs also includes an NSF CAREER awardee and a Fulbright scholar. Dietterich was nominated by Rebecca Hutchinson, who is currently working with him as a postdoctoral fellow, but has just accepted a joint faculty position at Oregon State in the School of Electrical Engineering and Computer Science and the Department of Fisheries and Wildlife. Hutchinson managed to surprise Dietterich with the award at an end of the term lunch for his research group. “Tom demonstrates exceptional commitment to his postdocs’ success, provides tremendous resources for professional development, cares about their personal needs as well as their professional success, and is approachable and resourceful when needs arise,” Hutchinson said. Dietterich is a leader in artificial intelligence research and is the president of the Association for the Advancement of Artificial Intelligence. This year he has been in the news regarding the benefits and risks of artificial intelligence (The Wall Street Journal, Digital Trends, Future of Life Institute, Boston Herald). His research contributes to diverse areas such as drug design, scheduling, information management, ecological modeling and agricultural pest management. “Postdocs in Tom’s lab benefit from being part of world-class research under the tutelage of a great mentor. In addition, Tom makes an effort to enrich the experience of all postdocs in our school by including them in the broader faculty community and spearheading addition opportunities for their learning,” said Bella Bose, interim head for the School of Electrical Engineering and Computer Science. The Technology Association of Oregon (TAO) sponsored an Education Roadshow at Oregon State on May 28 to help students tailor their education to match industry needs. Representatives from AKQA, Columbia Sportswear, Hewlett-Packard, Tripwire and Vadio answered questions about what to expect when entering the workforce and how best to prepare. The event drew 250 students which was beyond the expectations of Danny Dig, assistant professor of computer science, who facilitated and moderated the event. Maria Powell, who attended the event, said, “Being able to get first hand advice from professionals in the industry is invaluable to me. It not only gives me ideas of what I would like my goals to be beyond college but it helps me to be pro-active about my future right now.” Powell is a senior in computer science who will be graduating this August. Nicholas Nelson, came to the event with more experience than most students since he worked in industry before returning to school in 2012 to finish his degree. “Our industry operates at such a fast pace, things that seemed common place three years ago when I was still working are likely to have changed. I wanted to be aware of the latest and greatest, and this industry panel did not disappoint. The diversity of panelists provided an excellent glimpse into both the start-up world and the established giants of industry,” Nelson said. To make the time with the panelists the most effective, Dig polled students ahead of time to find out what questions they most wanted answered. The top two questions were: What questions should a prospective candidate ask during an interview? What kind of coursework and/or research projects are valued by industry? All the questions and answers are available on the EECS website. “The students loved the event and many commented that these kinds of events make them feel lucky to be at Oregon State. Several of them have continuing discussions with the panelists about jobs and interviewing,” Dig said. The event fits with the mission of the TAO to grow the technology economy in the region by providing programs and initiatives that support industry promotion, advocacy, professional networks, and talent development. Dig acknowledged the help of the panelists: Bryce Clemmer (Vadio), Andy Neville (Columbia Sportswear), Andy Doan (AKQA), David Whitlock (Tripwire), Shelly Reasoner (HP) who volunteered their time to answer questions; Tina Batten who helped organize the event; Kevin McGrath, instructor for Operating Systems who gave up a class period for the event; all the students who helped generate questions and took notes during the event; TAO, which started the Education Roadshow; and Chris Scaffidi, associate professor of computer science, who had the vision of bringing the Education Roadshow to Oregon State. Tanner Cecchetti, Eta Kappa Nu 2015 Sophomore of the Year. Tanner Cecchetti has always been a tinkerer, even as a child. His first experiments used simple technology such as tissue and corks to create tiny parachutes. Now, an electrical and computer engineering student at Oregon State, his focus is on mobile technology, and especially jailbroken iPhones. His interest was encouraged by his mother who initially started her degree in computer science before switching to accounting. She bought him video editing software in fifth grade when Cecchetti was part of a video editing team at school, and she made sure he had a cell phone when he was 10 years old because she wanted him to start playing with that technology. The many hours he spent tinkering with technology lead to success when in high school he earned second place for three years in a row at a state-wide team-based programming competition. “The coolest thing I’ve ever done with programming was to write a program that got a couple million downloads, which was super exciting,” Ceccetti said. The program was part of a business to create game cheats for Runescape that he and partners ran for a year in high school. Also in high school he volunteered to manage the website for Relay for Life of Sherwood, Oregon. It was a project he initially viewed as a way to get some practical experience, but it became more than that. “It felt good to be involved with that cause, raising money for cancer research, because cancer is what took my dad, so it was personally significant to me,” Cecchetti said. His father passed away when he was in fourth grade. Although Cecchetti has less time for tinkering as a college student, he found time to create a tweak for jailbroken iPhones that has over 10,000 downloads, and an app that turns an iPhone into a mouse and keyboard for any device. He also designed and built an inexpensive sound effects system using a Raspberry Pi for the submarine at the Oregon Museum of Science and Technology. In his first two years at Oregon State, Cecchetti earned scholarships for academic achievement including making the Dean’s list and receiving a scholarship from Pacific Power. “I have to pay for school on my own, so scholarships certainly make it easier for me financially but it also makes my decision to stay in school a lot easier knowing my burden of debt will be less,” he said. 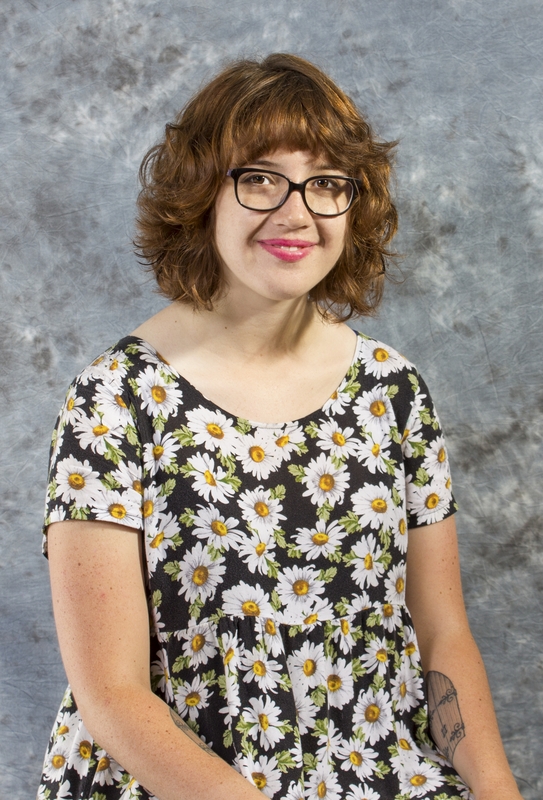 Perhaps it is not surprising that Cecchetti won the 2015 Eta Kappa Nu Sophomore of the Year Award at Oregon State. “Tanner stood out for his commitment to service, academic excellence and passion for problem solving. His impressive personal projects showed he was going above and beyond what was being done in the classroom,” said Oregon State Eta Kappa Nu president, Tanner Fiez. 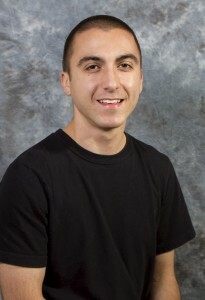 Although Cecchetti’s experience has mostly been in computer programming, he chose to major in electrical and computer engineering because he was interested in learning about hardware which would be more difficult to learn on his own. He initially thought he would pursue a career in designing cell phones but his experiences at Oregon State have opened up more options for him and he is not yet settled on a career path. For now he is content to continue to learn and tinker with technology. Amber Horvath, computer science student, received honorable mention for the Undergraduate Research Student of the Year Award at Celebrating Undergraduate Excellence (CUE) 2015. Students from all majors presented posters of their research or creative work. Abstract: Although there are many systems designed to engage people in programming, few explicitly teach the subject, expecting learners to acquire the necessary skills on their own as they create programs from scratch. We present a principled approach to teach programming using a debugging game called Gidget, which was created using a unique set of seven design principles. A total of 44 teens played it via a lab study and two summer camps. Principle by principle, the results revealed strengths, problems, and open questions for the seven principles. Taken together, the results were very encouraging: learners were able to program with conditionals, loops, and other programming concepts after using the game for just 5 hours.